No need to spend thousand dollars in PPC workshops while being unable to "replay" all the content for reference after you go home. 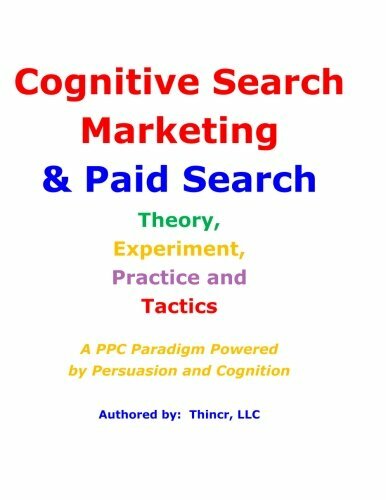 This 342-page content-rich search marketing strategic guide provides cognitive and experiment-based PPC campaign techniques that will never expire due to interface change and is able to save you a significant amount of SEM campaign management cost. The tips from this book are able to land you a much-needed helping hand when you need it the most. They can also recover you from the your PPC woes and ultimately take your PPC campaign to the next level! So, check out how these proven PPC tips are able to upgrade your campaign and get your copy today! A PPC / AdWords campaign driven by persuasion and cognitive science is found highly effective in the attitude change toward a defined conversion while a well-implemented PPC campaign and an effective experiment design in tandem is able to increase the overall marketing ROAS dramatically. Based on cognitive persuasion theories, this book help businesses achieve their corporate goals by optimizing the technical elements of their pay per click campaigns while facilitating a positive attitude change for the intended conversions. This book demostrates not only the key strategies for promotion and product positioning but also the tactics to boost sales revenue by leveraging customers' APV (Average Purchase per Visit) and NCV (Number of Converted Visit). Critical techniques are emphasized on the topics as follows: persuasive ad copywriting (based on various communication models of persuasion, appeals, and Maslow's hierarchy of needs) with examples and illustration, I-Can't-Wait ad copywriting technique, MRI placement-targeting, 20 top tactics for strategic bidding, strategic organic and paid listing arbitration to reduce campaign cost, and the illustration of portfolio and rule-based bidding paradigm, strategic campaign structuring, tactical keyword generation by buying and product life cycle, cognitively transferred terms, root phrases, misspellings, brand and intent variations, meta tags of competitors and niche high-profiled sites, long tail keywords, negative keywords, search query report data mining, niche keywords, etc., campaign management tips in response to Google Instant, top tips to leverage the Quality Score, implementation of Web Optimizer, technical approaches, paradigms, and techniques of landing page optimization with examples according to site natures, landing page real estate planning and element allocation, strategic setup of a landing page test on crucial page elements and its evaluation, conversion tracking techniques, goal and funnel analysis, implementation of Google Analytics and campaign metric interpretation, strategic application of ad extensions, deployment of product listing and comparison ads, adoption and practice of conversion attribution model, contextual and behavioral targeting, niche channel targeting and geo-targeting, and a comprehensive ad creative brief demonstration with case study, and so many more. The evaluation of marketing campaign performance based on the cross-exam from both macro-level and micro-level perspectives through an effective experiment design is investigated while the tactics about generating AdSense revenue through strategic ad unit placement and content development are presented. Furthermore, the studies in this book are going to reveal the secrets about how to extend the practice of strategic PPC in an online job search process to help job seekers land their dream jobs. Feel the PPC pride and don't hesitate! Grab these top proven tactics and be successful on your paid search campaign now! If you have any questions about this product by Thincr LLC, contact us by completing and submitting the form below. If you are looking for a specif part number, please include it with your message.